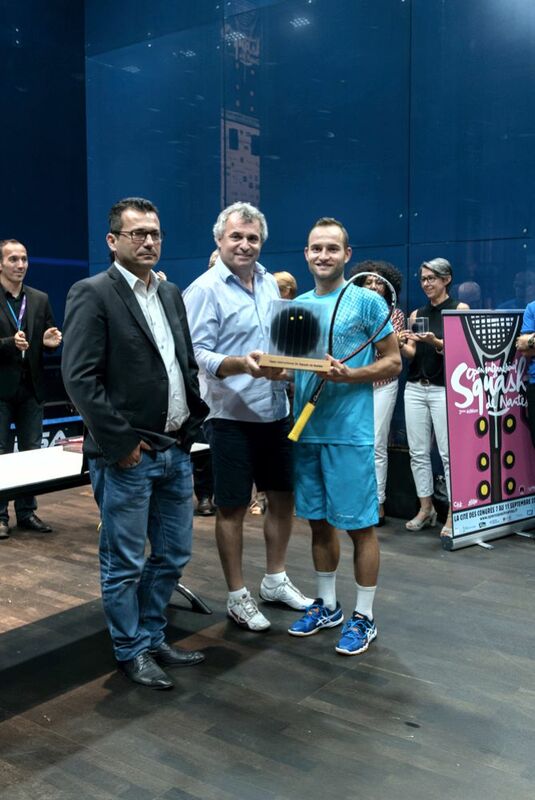 Frenchman Gregoire Marche and Egyptian teenager Hana Ramadan took the honours at the 2016 Open International de Squash de Nantes after they rose to final wins over English duo Chris Simpson and Rachael Chadwick, respectively, at the Cité Internationale des Congrès. Defending champion Marche, who defeated Finland’s Henrik Mustonen to win last year’s title, was in brilliant form throughout a week of top-class action at the PSA M25 event and put Richie Fallows, Olli Tuominen and top seed Daryl Selby to the sword to ensure that he would be pitted against World No.23 Simpson in the final. It was free-flowing squash from the outset, with Marche’s superb retrieval abilities evident as he built up a one-game lead, before an improved Simpson levelled in the second. The majority of the third game was neck and neck, with Marche eventually pulling away to restore his advantage, and the Frenchman rode the wave of fervent home support in the fourth and final game to seal an 11-6, 8-11, 11-6, 11-2 victory - with a superb cross court nick at championship ball greeted by an almighty roar from the crowd. "Today, I felt really good from the beginning," said Marche. "I found my length first, kept the same rhythm and I was in front of him all match. I was a bit nervous in the second game, and I think, maybe one or two years ago, I wouldn’t be able to keep the same concentration like I did today. "I’ve worked on this a lot since last year, so today I’m really happy. It’s my biggest title on the Tour, so it’s a great day. Everything worked, the crowd was a big part of the story here in Nantes as well." Meanwhile, Ramadan and Chadwick also served up an entertaining fixture in the inaugural Women’s final, with points ebbing and flowing between the pair before Ramadan took a one-game lead on the tie-break. Alexandria-born Ramadan put in an immaculate display in the second game, doubling her advantage for the loss of four points, but Chadwick came out fighting in the third and varied the length and pace of her shots to storm to victory and halve the deficit. Ramadan was soon back in the driving seat though and she closed out the fourth to record a 12-10, 11-4, 2-11, 11-9 triumph to capture her third PSA World Tour title. “The atmosphere was amazing, everyone was very loud, very cheerful, and I had the pressure of not disappointing them and I also wanted to perform my best,” said Ramadan. “It was pretty exciting for me, but there was also a lot of pressure. I wanted to do my best, but I also lost my focus, which was a bit disappointing for me. 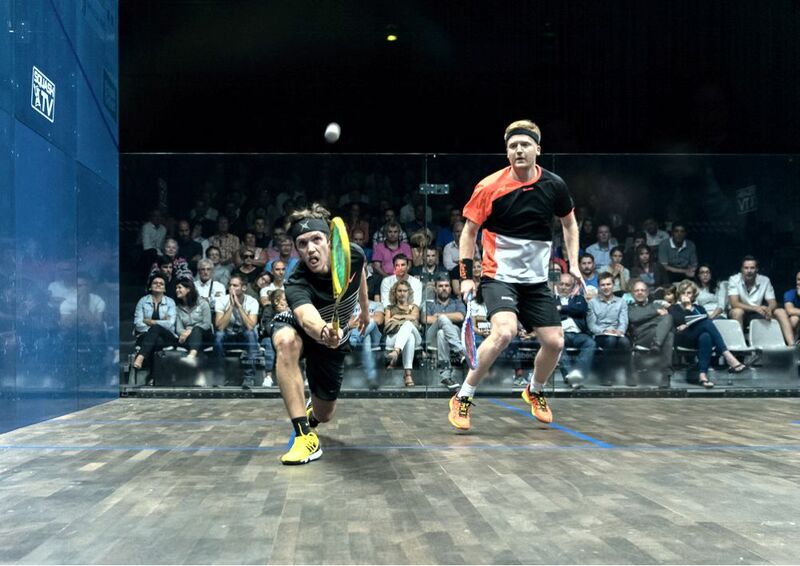 England’s Chris Simpson and Frenchman Gregoire Marche will go head-to-head in the final of the Men’s Open International de Squash de Nantes, PSA M25 tournament after they rose to respective wins against Tom Richards and Daryl Selby at the Cité Internationale des Congrès. Simpson, the number two seed, faced off with Richards in a thrilling spectacle that saw both players bring a vocal crowd to their feet. With the scores level at 1-1 after the first two games, Simpson eventually managed to gain momentum and he took the third and fourth games without reply to wrap up an 11-4, 7-11, 11-9, 11-4 victory. "Tom and I have been playing since we were nine or 10 years old. He’s one of my best mates, and when we play each other it’s always very close and very enjoyable," said Simpson. "I thought that match was no exception, it was a very high standard, very fair and very, very tough. He was on top, not just in the second game, but for most of the third as well. "I got back on top by just fighting and trying to force myself to be positive at the end of the third because I knew he controlled the start of the second until two thirds of the way through the third game, so I had to change something." Defending champion Marche, meanwhile, managed a superb victory against top seed Daryl Selby after a scintillating performance from the World No.29 saw him win in straight games. Marche capitalised on a slow start from the Englishman to go a game to the good, and put in a sensational display in the second to double his advantage, coming out on top of a series of exciting rallies. The 26-year-old’s onslaught continued into the third as the man known as ‘The Acrobat’ dictated the tempo of the match and he made very few errors to blitz to the win by an 11-7, 11-6, 11-5 margin - claiming his first win over Selby in the process. "That was maybe one of my best matches," said Marche. "I think I played pretty well from the beginning to the end. I don’t know if he was 100 per cent today, but I did the job and I think I played my game. I was really focused and I had my game plan from [coach] Thierry Lincou. "He gave me a lot of advice today and I’m really happy to win 3-0 like this because it means my level is improving. I have never beaten Daryl before, so it’s a great win." 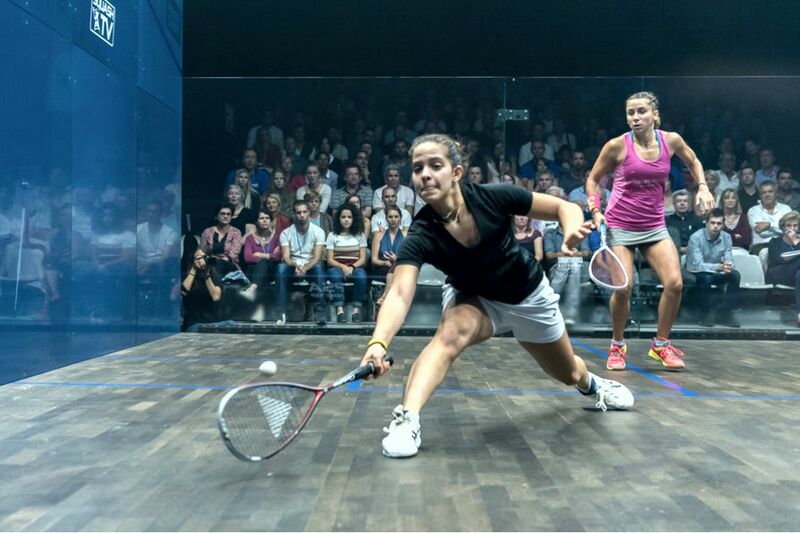 Elsewhere, the Women’s final will see 18-year-old Egyptian Hana Ramadan take on England’s World No.98 Rachael Chadwick after they achieved respective wins over Laura Pomportes and Julianne Courtice. Ramadan overcame a nervy start against Pomportes, who was cheered on by a raft of home supporters, to record an 11-9, 11-9, 11-9 victory in 33 minutes. “I tried to focus more on my game plan and my shots,” Ramadan said. “They weren’t that deep at the beginning, so I had to regain focus, try to work things out and concentrate on court because I wasn’t at the beginning. Laura is a very good player, wining 3-0 against her is a great achievement, and all credit to her for making the game so challenging." Chadwick was pushed to four by Courtice in a highly entertaining battle that saw both players take two games apiece to set up a tense fifth game showdown. Chadwick stormed into an early lead in the decider and fended off a late fightback from Courtice to move through to a second successive final after reaching the same stage at last month’s Legacy Wealth Belfast Open. “It’s been a fantastic week, in front of a fantastic crowd,” said Chadwick. “As ever, it was a huge 3-2 battle against Julianne. I know how hard she’s been training, I was expecting it to be tough, and it was. I think she played extremely well, hitting very hard and very solid. As for me, I was retrieving well, and I dug in well." 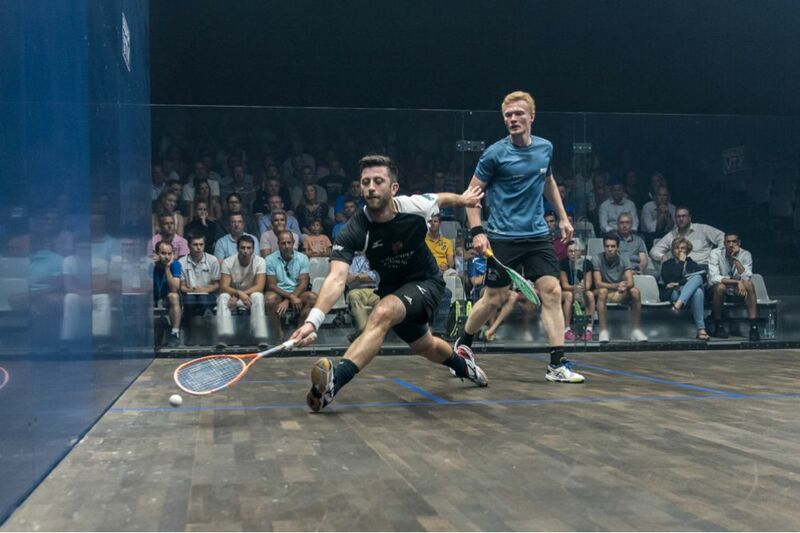 There is guaranteed to be an English finalist in the 2016 Open International de Squash de Nantes, PSA M25 tournament after World No.19 Daryl Selby, World No.23 Chris Simpson and World No.26 Tom Richards all triumphed in their quarter-final fixtures at the Cité Internationale des Congrès. Selby stepped up his attempts to win a first PSA World Tour title since 2012 after he dispatched Welshman Joel Makin in an entertaining encounter. An early 80-shot rally set the stall out for a high-octane affair, with Selby eventually winning in a deceptively difficult 3-0 victory to reach the semi-final stage. "I thought my length was good, but I just couldn’t get it to die off, and he picked up so many balls," said Selby. "He makes you win the rally three, four or five times, but I’m really happy with the way I played. If I hadn’t have been as sharp as I was and playing as well as I was then that could have potentially been a big upset because he is playing much, much higher than his ranking. "Last month in the Australian Open, he beat [World No.33] Paul Coll 3-0, so that says it all really. I knew I was in for a tough game and I’m delighted that I came off and won 3-0." Simpson is also through to the last four after overcoming World No.39 Declan James in an all-English affair. The Guernsey-born 29-year-old was appearing in his 350th PSA World Tour match and built up a one-game lead before a mature display from James, six years Simpson’s junior, restored parity. The duo contested a number of brutal rallies in a high-octane third game, with Simpson coming out on top again after unforced errors began to creep into James’s game, and the higher-ranked Englishman closed the fourth out impressively to secure safe passage through to the semi-final by an 11-5, 4-11, 11-6, 11-7 margin. "Dec and I haven’t played a lot, but we’ve trained a lot and we actually played in the final of a tournament the same size as this in Paris at the end of last season," Simpson said. "I knew that he was playing above his ranking, above his seeding here and it was a very tough draw and a very tough match. "I tried to stop Declan from having the middle of the court because he’s very big and his skills are his strength, so I tried to keep it very tight. I thought I did that very well, apart from the second game when maybe I hit too many errors." Simpson will go head-to-head with Richards for a place in the final after Richards dispatched Egypt’s Karim Ali Fathi in a punishing five-game battle to progress. The 30-year-old from Guildford went two games up and on the cusp of victory, before a tenacious display from Fathi brought the match back to all square. But Richards then dominated the court to build up seven match balls, and he converted at the second attempt to wrap up a punishing win in five. "I switched off a little bit for the two games I lost," Richards admitted. "He played better, he played well, and I was really annoyed with myself after the fourth game. I just thought that I had done so much training throughout the summer, so I might as well give it all I can in the fifth and luckily it paid off." Defending champion Gregoire Marche is the only non-Englishman left in the draw after he saw off Finland’s Olli Tuominen on home soil to set up a mouthwatering semi-final clash with Selby. 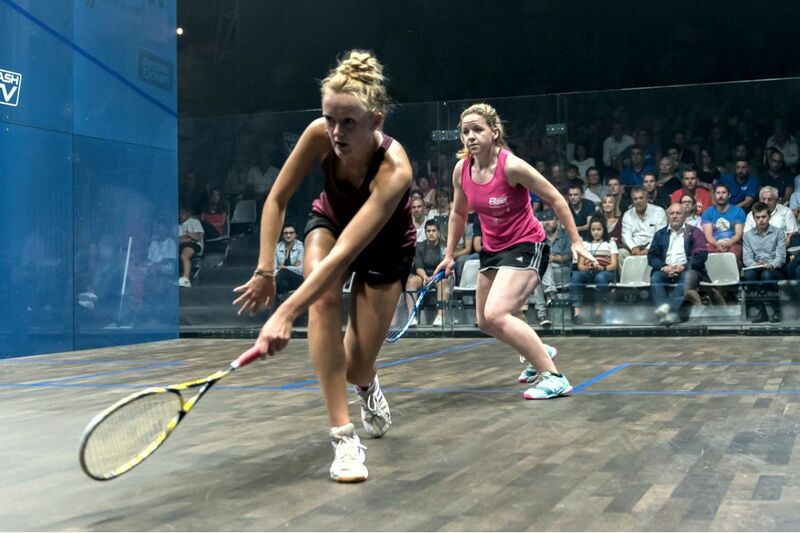 Meanwhile, the Women’s event will also have an English finalist after World No.98 Rachael Chadwick and qualifier Julianne Courtice defeated second seed Alexandra Fuller and Nadia Pfister, respectively. The two Englishwoman will line up against each other in the last four, while French player Laura Pomportes defeated compatriot and number one seed Chloe Mesic to ensure that she will take on Egyptian number three seed Hana Ramadan, who beat Tessa ter Sluis, for a place in the final. A trio of Englishmen - headed by World No.23 Chris Simpson - were victorious on the second day of first round action at the Open International de Squash de Nantes, PSA M25 tournament held at the Cité Internationale des Congrès. Second seed Simpson came up against tournament wildcard Geoffrey Demont in his opening round fixture and recovered from a slow start to rise to an 11-6, 11-8, 11-7 victory. "I think I just tried to work on the process and playing good squash," said Simpson. "He played some unbelievable shots and I had hit the ball into the middle of the court. I just tried to work on my end and I knew that if he could carry on hitting those unbelievable shots then I was going to be quite surprised. "No one can carry on at that rate, so I knew that level was going to drop at some point." Simpson will line up against compatriot Declan James in the next round after James put in an imposing performance to overcome French qualifier Christopher Andre. Andre, the World No.107, came through qualifying to progress to the main draw, beating the experienced Piedro Schweertman in the process, and fared well in the early stages. However, the high intensity and immaculate width of James’s shots soon came to the fore the longer the match went on, enabling the World No.39 to complete the win by an 11-6, 11-2, 11-7 margin in 37 minutes. “I’m very happy to win in three games,” said James. “I haven’t seen Christophe play much, but I’ve heard many good things about him. I know he’s not been on the Tour that long and I heard he is very good with the racket. "It was the first match of the season, there are going to be a few nerves and I felt like I couldn’t let my head drop for one minute or otherwise he could come back." Tom Richards was the other Englishman to prevail on day two after he overcame Indian opposition in Mahesh Mangaonkar. The match began on an even keel, with a series of punishing, attritional rallies playing out in front of a packed crowd, but Richards’ experience and patience eventually paid off and the 30-year-old wrapped up the win in straight games. “I was trying to get a feel for the court, I felt pretty good, so I was trying to make it tough for him and put some miles into his legs,” Richards said. World No.50 Ben Coleman was the only Englishman to exit the tournament on the second day of action after he succumbed to Egypt’s Karim Ali Fathi, who will face Richards next. In the inaugural PSA W5 Women’s tournament, French duo Chloe Mesic and Laura Pomportes ensured that there would be home interest in the last eight after they defeated Nia Davies and Marina de Juan Gallach, respectively. Mesic and Pomportes will now face off for a place in the semi-final, while there were also wins for the likes of title contenders Alexandra Fuller and Hana Ramadan. 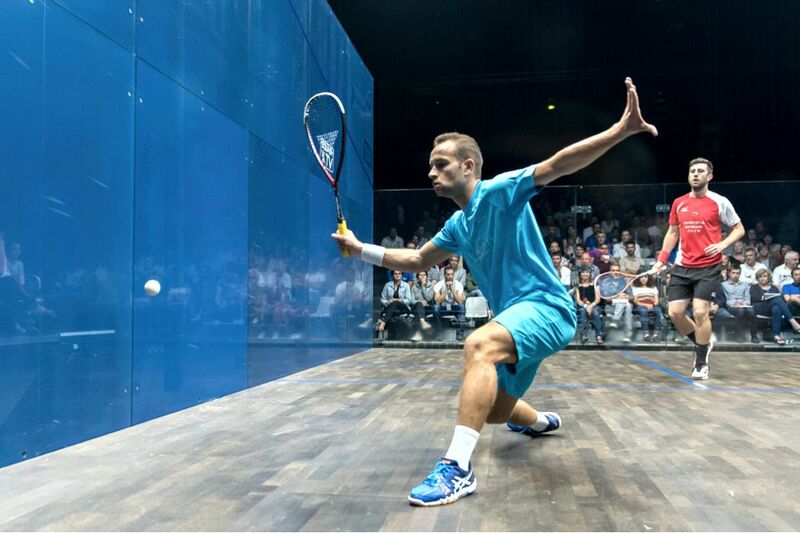 Title holder Gregoire Marche sealed his place in the quarter-final of the Open International de Squash de Nantes on home soil after the Frenchman came out on top of a one-sided affair against England’s Richie Fallows at the Cité Internationale des Congrès. 26-year-old Marche, who is ranked 39 places above Fallows in the World Rankings, started quickly and controlled proceedings throughout the 33-minute clash, with his impressive retrieval ability and deft touch at the front of the court in full flow as he powered to an 11-5, 11-2, 11-4 triumph. “I love this tournament, I won it last year, so obviously I like the place,” said Marche. “It’s nice, it’s at home, so the crowd is amazing. 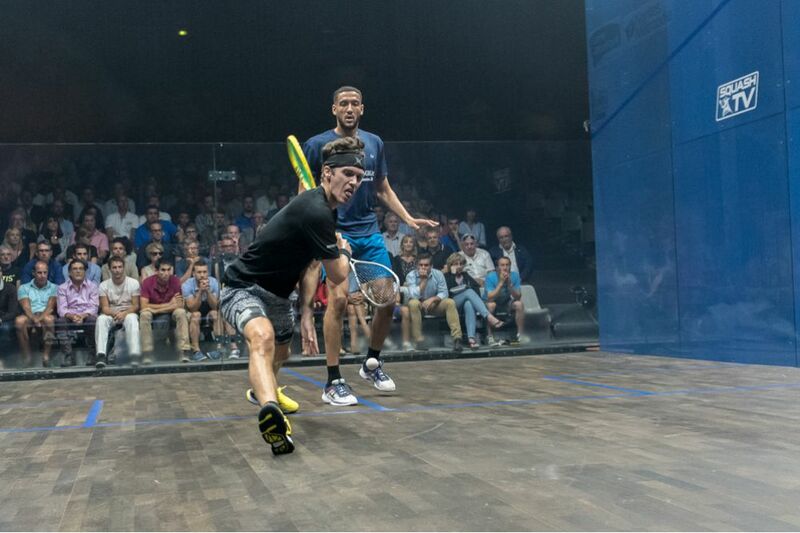 They know squash, they know how to play, so it’s good to feel it. “I was expecting a closer match, but I think I played well from the beginning. I was pretty intense with my hitting at the beginning of each game and I was really happy with the way I hit the ball tonight. I was surprised because I went 6-2, 7-2 up in each game, so I think it made the match easier." Marche is set to face experienced Finnish campaigner Olli Tuominen in the next round after the 37-year-old managed a superb come-from-behind victory over Germany’s Jens Schoor. Tuominen looked to be heading towards an early exit from the tournament after a lacklustre start to the match saw him go 2-0 down against a dominant Schoor. But the former World No.13 used his vast 18 years of experience to good use as he finally found his rhythm, taking the next three games without reply to seal a 7-11, 2-11, 11-8, 11-4, 11-6 triumph. “It was a very tough fight, a very close game,” said Tuominen. “I just tried to get myself together and get my game going. I was making a lot of mistakes and not getting the ball to the back, just basic mistakes of the game. Luckily, I got a bit better in the third, but it was still a struggle to the end. Welsh qualifier Joel Makin came up with the day’s biggest upset as he bridged a 33-place World Rankings gap to defeat United States No.1 Todd Harrity. Makin, 21, advanced through qualifying without dropping a game and he continued his fine form into his match with Harrity, beating the World No.49 in straight games to reach the quarter-final. "I haven’t seen too much of him [Harrity] before," Makin said. "I knew how I wanted to play, I wanted to make it very tough and tried to keep the error count down. At the start, he was on top quite a lot, getting in front of me and volleying. I started to take it in a bit more and I was happy with how I played in the end." Top seed Daryl Selby was also in action on day one, eliminating fellow Englishman Jaymie Haycocks to set up a last eight meeting with Makin. Qualifying for the inaugural Women’s tournament also came to an end, with Marina de Juan Gallach, Charlotte Delsinne, Cindy Merlo and Julianne Courtice all progressing to the main draw. De Juan Gallach will take on Laura Pomportes in round one, while Delsinne is pitted against England’s Rachael Chadwick. Merlo and Courtice, meanwhile, are set to lock horns with Tessa ter Sluis and Enora Villard, respectively. French World No.107 Christophe Andre sealed his place in the main draw of the 2016 Open International de Squash de Nantes on home soil after upsetting Dutch World No.77 Piedro Schweertman in the final round of qualifying at the Cité Internationale des Congrès. Andre, 29, is appearing at his first PSA World Tour event of the 2016/17 season after winning four tournaments during the last campaign, and made a fine start to proceedings with a straight games win over New Zealander Lance Beddoes in the previous round. The number seven qualifying seed’s match with Schweertman began evenly, with both players taking a game apiece, before Andre pulled away to complete an 11-8, 9-11, 11-4, 12-10 victory to ensure that he will meet England’s Declan James in the opening round of the main draw. James’s compatriot, World No.87 Jaymie Haycocks, caused the day’s other upset after he bridged a 32-place World Rankings gap to dispatch top qualifying seed Mazen Gamal by a 3-0 margin. Up next for Haycocks is a fixture with title favourite Daryl Selby as the two Englishmen get set to meet for the first time on the PSA World Tour. The final round of qualifying also saw England’s Richie Fallows and Welshman Joel Makin advance to the main draw of the PSA M25 tournament after respective victories against Baptise Masotti and Chris Fuller. Fallows will clash with home hope Gregoire Marche in the next round, while Makin will take on United States No.1 Todd Harrity. Meanwhile, the opening round of qualifying at the inaugural Women’s event got under way and saw a French trio consisting of Charlotte Delsinne, Marion Romba and Laura Paquemar emerge unscathed. Delsinne and Paquemar will meet for a place in the main draw after beating Sabrina Belliot and Fanny Segers, respectively, while Romba axed Emmanuelle Le Brun to set up a clash with Switzerland’s Cindy Merlo. 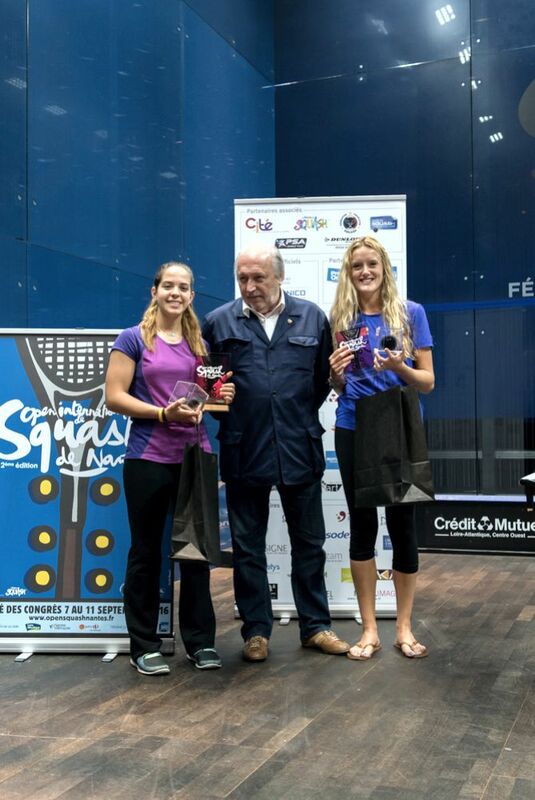 There were also wins for Marina de Juan Gallach, Emma Custance Baker, Julianne Courtice and Paulina Krzywicka, all of whom will join the battle for a main draw berth on the second day of qualifying at the PSA W5 tournament. The opening qualifying stage of the 2016 Open International de Squash de Nantes, PSA M25 tournament saw all but one seeded qualifier progress to the final round of qualifying at the Cité Internationale des Congrès in France. World No.125 Baptiste Masotti upset the seedings as he dispatched Belgium’s number six qualifying seed Jan van den Herrewegen in four games. The 21-year-old, performing on home soil, went a game down in the early stages, but recovered to record a 4-11, 11-2, 11-4, 11-8 triumph that sees him move to within one win of the main draw stage. The Frenchman will go head-to-head with England’s Richie Fallows in the next round and will be hoping that home advantage will be enough to earn him a win over a player that won his second PSA World Tour title a fortnight ago at the Legacy Wealth Belfast Open. Christophe Andre, the World No.107, was the other French player to advance to the final qualifying round courtesy of a 3-0 win against New Zealand’s Lance Beddoes, and he will face experienced Dutchman Piedro Schweertman, who defeated local player Johan Bouquet. Elsewhere, England’s Chris Fuller and Welshman Joel Makin will meet in another of the fixtures on the final day of qualifying after they achieved wins over French duo Auguste Dussourd and Victor Crouin, respectively. Birmingham-based Jaymie Haycocks was also triumphant in his first qualifying round match against Enzo Corigliano and will take on Egypt’s Mazen Gamal for a place in the main draw, with Gamal receiving a bye. Switzerland’s number one Nicolas Mueller has withdrawn from the forthcoming Open International de Squash de Nantes 2016, PSA M25 tournament, due to injury. As a result German Jens Schoor moves up the draw to occupy a place in the main draw, where he will face against experienced Finnish campaigner Olli Tuominen while England’s Declan James moves up to hold the number five seeding in pace of Mueller.